Protesters in Venezuela have been mobilizing almost daily and in large numbers since the Supreme Court of Justice  temporarily nullified the National Assembly on March 30, a move that many described as a “self-inflicted” coup . The change sparked international outrage. Although the court reversed course  days later and reinstated the National Assembly, public unrest has continued, forcing public officials to confront the economic and political crisis that has been ongoing since 2014. Alongside political turmoil and rising rates of violent crime, the global drop in the price of oil, the country’s main export, has left Venezuela with staggering inflation rates for more than three years. Inflation has not fallen below 50% since 2014 . It exceeded 100% in 2015, and reached 800%  at the end of 2016. President Nicolas Maduro has repeatedly  blamed the United States  for the downturn in the oil market. Citizen media have become increasingly important for Venezuelans throughout this period, as the Maduro administration has sought to maintain tight control  over official and corporate media outlets. A mainstay of critical reporting on the country, CNN, was kicked off of cable  television in February 2017. This has left citizen media outlets among the few sources of information regarding protests  and crackdowns that readers can turn to. Perhaps as a result, numerous independent journalists  have experienced harassment and physical threats while on assignment in recent weeks. 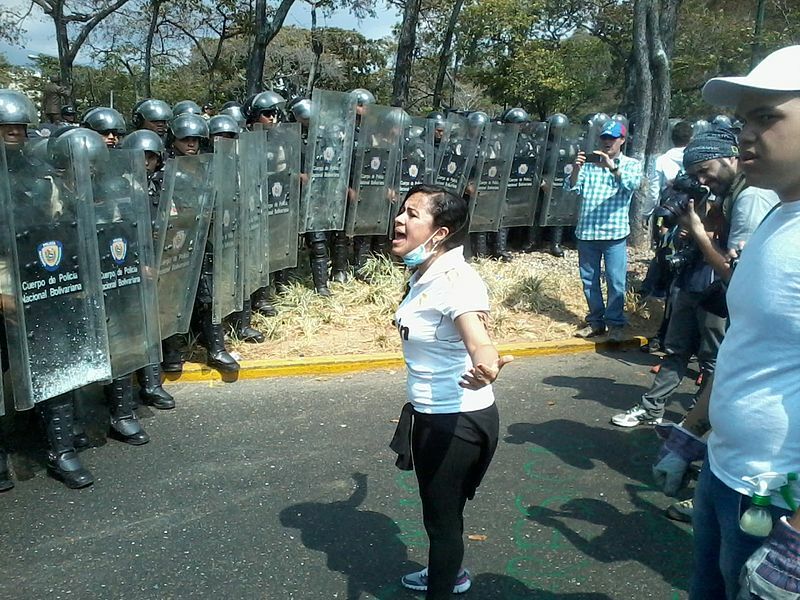 Elvis Flores, a cameraman for the online channel VPITV was arrested mid-broadcast  while filming protesters in Caracas. For nine hours, he was held in custody where he was reportedly beaten. VPITV and other popular web TV channels including Vivoplay and El Capitolio TV were blocked  from April 7 onward, according to Venezuelan netizens. In response to the censorship, protesters have united around the hashtag #VzlaTrancaContraElGolpe (“Venezuela blocks the coup”). Kuwaiti human rights defender Hadeel Buqrais received a rash  of online threats after she took part in a march in Kuwait City calling for women’s rights in Saudi Arabia. The march was part of the Namshi Laha, or “Walking for Her” campaign, which launched online last week. There have been attempts to block the campaign, and other participants involved in the campaign have also been targeted  with insults on social media, according to Frontline Defenders. In the Philippines, House Speaker Pantaleon Alvarez filed a bill mandating  that social media companies verify the identity of users before registering them on their networks, in what he describes as an effort to more easily prevent users from creating fake accounts and spreading fake news. Russia's media regulator announced  plans to block Zello, a mobile push-to-talk app that Russian long-haul truckers have used to organize protests in recent months. Roskomnadzor, the authority responsible for monitoring Russian media, has publicly stated that Zello failed to submit company information necessary to be included on the federal “Registry of Information-Dissemination Organizers,”  a list of online platforms that Roskomnadzor oversees. As presidential elections approach in Iran, the contrast between the relatively moderate current president Hassan Rouhani (who is expected to seek re-election) and political hardliners is increasingly visible. In the first-ever Iranian government press conference to be broadcast over Instagram Live , Rouhani boasted about many of the achievements  of his administration, including the effort to improve Internet speeds in Iran, which indeed have seen a ten-fold increase. He also claimed that if it wasn’t for the efforts of his administration, “all social media platforms would have been sacrificed.” Although Facebook is still blocked inside Iran, Instagram has remained uncensored throughout the Rouhani administration, along with other popular foreign platforms such as WhatsApp and Telegram. Nevertheless, some people have paid high prices for their participation on said platforms. On March 14, a dozen administrators of news channels on the messaging app Telegram were arrested by Iran’s hardline Revolutionary Guards , who said the channels — which are chiefly reformist and moderate in their political leanings — represented a threat to national security. To the chagrin of the judiciary , President Hassan Rouhani has since called for an investigation of the arrests, underscoring the political cleavage between the two entities. In the first week of April, the Apple TV app store blocked the satirical news show  China Uncensored from users based in mainland China, Hong Kong and Taiwan. The creators of the show said that while they understand why the show is censored in China, they do not think the block in Hong Kong and Taiwan is justified. They sent a letter to Apple CEO Tim Cook demanding the company unblock the show in Hong Kong and Taiwan within 30 days. Afef Abrougui, Mahsa Alimardani , Ellery Roberts Biddle , Oiwan Lam , Weiping Li , Leila Nachawati  and Sarah Myers West  contributed to this report.